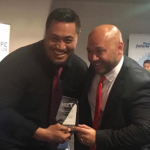 Hire Connect (formally Machine Lease) was formed in March 2013 with a partnership between Saia Latu and former NZ League star Joe Vagana. Saia Latu has over 15 years experience in the industry with previous roles in other leading Hire companies as well as experience in civil infrastructure and project management. In recent years Saia has also built and managed additional businesses below. Joe Vagana former NZ Warrior and Kiwi League Legend. Joe’s professional career spanned over 14 years , playing over 350 1st grade games for both then called Auckland Warriors (6yrs) in the Australian competition and the Bradford Bulls (8yrs) in the English Super League Competition. Joe Also represented both Samoa (3) and the New Zealand Kiwis (27) in the 1995 and 2000 Rugby League World Cups respectively. In March 2013 Saia went out on his own as a contractor and together with Joe they built on the relationships and partnerships they had created over the years established Hire Connect which at first concentrated mostly on long term lease for large projects namely the Waterview Tunnel, followed by the Waikato Expressway as the years went on and the business grew it is now also working with short term and long term lease and general hire. Hire Connect pride themselves on the service they provide to their customers, being more than just a Hire Supplier they aim to provide a solution, rather than just hire equipment and machinery to you they will go the extra mile to help and become invested in the success of their customers. -Trow Group, a civil infrastructure business which compliments the machinery hire with regards to equipment and employment. -SFL Group NZ, a consulting company that provides consulting services for the above industries as well as other community business support to small businesses, churches and communities. -SFL Group Tonga an established branch in Tonga has been setup called Tongan Auction House where it works with schools and churches to provide good quality recycled furniture and building materials that come out of the projects from Trow Group.